Madeline Burchard is the May EarthTeam Teacher of the Month. Madeline is a Campus Coordinator at EarthTeam who facilitated two year long internships this year at San Lorenzo and Skyline High School. At Skyline High Madeline ran a Watershed focused internship bringing students into their local Sausal Creek watershed for restoration events, scientific studies, community outreach and outdoor exploration. At San Lorenzo Madeline led an enthusiastic group of students focused on studying and combating litter on their campus and in the surrounding community. She helped students launch a Change.org petition to tackle the number one litter item (plastic straw wrappers) found on campus that has received over 7,000 signatures from around the world to date. Madeline's experience as a scientist and educator and unrivaled enthusiasm for student success has made her a role model for students and staff alike. At the end of this school year Madeline is graduating from her role at EarthTeam to take a position at Sandia National Laboratories. We are sad to see Madeline go, but are happy to have had her on our team for almost two years. We wish Madeline the best of luck in her next career step! Leslie Ganick is the March EarthTeam Teacher of the Month. Leslie has been a longtime supporter of EarthTeam as the lead teacher and academy director at Pinole Valley High School's Environmental Studies Academy. Over the years Leslie has worked with the academy to coordinate field trips, write grants, attend field events and generally breath life into an environmental program that has brought so much value to Pinole High. Her ideas, creativity and drive help provide incredible opportunities for students at Pinole Valley High including coordinating a recycling club, planning field trips and supporting years of after school internships. We're grateful to have worked with Leslie for so many years and look forward to working with Pinole Valley for many years to come. Berkeley High School teacher Devon Brewer is the EarthTeam November Teacher of the Month. Devon helped coordinate 3 teachers and 9 classes for the Waste Action Project in September at Berkeley High where students sorted, catagorized and weighed over 320 pounds of trash. Their findings are below. Students are still working on the action plan in response to their findings and are hoping to help reduce the amount of waste students are sending to the landfill at Berkeley High. 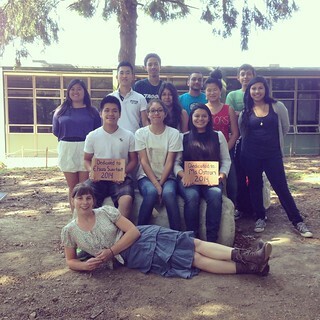 Thanks for supporting students, teachers and waste reduction education at Berkeley High Devon. Keep up the good work! 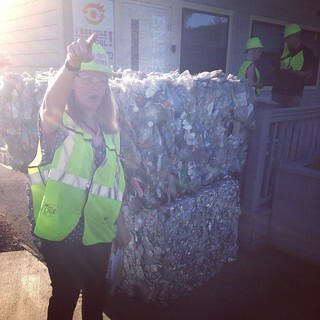 To see photos of the Waste Audit in action, visit our Google+ page. Roberta Miller is our Teacher of the Month for October 2014. While Roberta doesn't teach in a traditional classroom, her teaching skills, passion and impact are on par with the best teachers we know. Roberta is a Program Manager at StopWaste.org and has been one of the standout presenters at our annual LEAF conference for more years than we can remember. 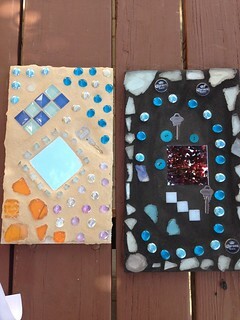 She has a passion for reused and upcycled crafts including these amazing reuse mosaics made by students in her workshop at this past year's LEAF conference. Roberta is one of the original founders of the Service Learing Waste Reduction Network (SLWRP) which supports dozens of teachers at middle and high schools throughout Alamdeda County and works tirelessly behind the scenes to support waste reduction efforts throughout the county. In addition Roberta is pivotal to the opporation of the iRecycle program which invites classes to visit the Davis Street Transfer Station and education center each year. Thank you for your continued efforts Roberta! Tracy Ostrom is the EarthTeam teacher of the month for May 2014. Tracy has a long history of working with EarthTeam over the past 7+ years and is a environmental force at Skyline High School in Oakland where she teaches. Tracy was instrumental in the formation of a Green Energy Academy at Skyline High School where she is the director. 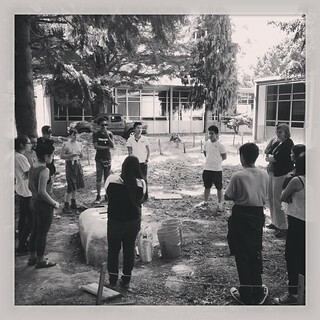 This past year, Tracy advised during a year long after school internship which found students continuing to build an outdoor classroom on campus. In it's second year, this outdoor classroom was thought up, researched and built completely by students with the support and mentorship of Tracy and EarthTeam staff. We are ever grateful for Tracy's leadership and support of students. She believes in empowering students to find solutions to the problems they see in the world and work towards goals they set. EarthTeam is honored to have worked with Tracy this year and all of the past years at Skyline. See below for photos of the Skyline student interns dedicating their freshly finished bottle brick bench to her and former Earthteam staff Chiara Swartout. Thank you Tracy. Keep up the amazing work! Chiara Swartout is the EarthTeam Teacher of the Month for April. As a dedicated restoration leader and staff member for the past 6 years, Chiara has worn many hats for the organization and contributed greatly to the formation and success of many of EarthTeam's well loved programs such as EcoStewards and internships such as Richmond High School's Aqua Team, and Skyline High School's Environmental Justice League. Chiara loves working outdoors directly with students and sharing her wide knowledge of everything from redwood to marine ecosystems with students and teachers alike. She has advocated tirelessly for students to have real, hands-on experiences with service learning projects that have resulted in litter clean ups, nature walks, outdoor classroom creations, peer-to-peer teaching opportunities and a lot of wonderful memories for students engaging with nature while making friends and an impact. Chiara recently moved on from EarthTeam this April and so we want to take the time to honor her for everything she has contributed to EarthTeam. We are very grateful for all of her time, creative energy and dedication to the students, teachers and schools she worked with as well as the support and focus she shared with EarthTeam as the organization has developed over the years she has been here. Thanks for all the great work Chiara! Nate Ivy is a superhero. He's a teacher turned organizer and networking guru with a penchant for connecting people with resources and opportunities that move projects forward. He's also one heck of a nice guy. 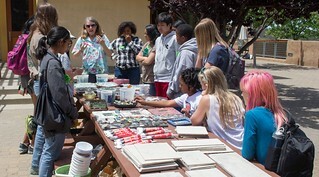 Nate spends most of his time behind the scenes as the facilitator for the Service-Learning Waste Reduction Project or SLWRP, which acts as the glue connecting over 35 middle and high school environmental programs throughout Alameda County. While Nate is no longer in the classroom, his role as a teacher, mentor and supporter of teachers, students and professionals dedicated to environmental change is unparalleled. We here at EarthTeam are honored to partner with Nate and the SLWRP network to better environmental education throughout the East Bay. Thank You Nate! Watch the interview with Brenda below. Brenda Calvert is a hero for waste reduction. Brenda has been working with EarthTeam for over 5 years now, bringing the Waste Action Program to her Economics classes at Fremont's John F. Kennedy High School. She's helps students become leaders for positive change and waste reduction on campus all with a smile on her face. We commend Brenda for her continued great work. Thanks for inspiring students to take leadership roles in their campus and beyond. Watch the interview with Neha Shah below. Neha Shah is EarthTeam's October teacher of the month. Neha is a special needs teacher at Horner Jr. High School in Fremont, CA who plays a large role in helping students make a positive impact on their campus and community. In addition to her teaching duties, Neha works with students campus wide and helps, "run the recylcing, composting, environmentally friendly activities" at her school. She works with the ASB teachers and student "Green Team" leaders to help keep the campus clean and help students educate others on campus. In October Neha helped coordinate two days of waste audits at with EarthTeam and ASB students at Horner Jr. High School. 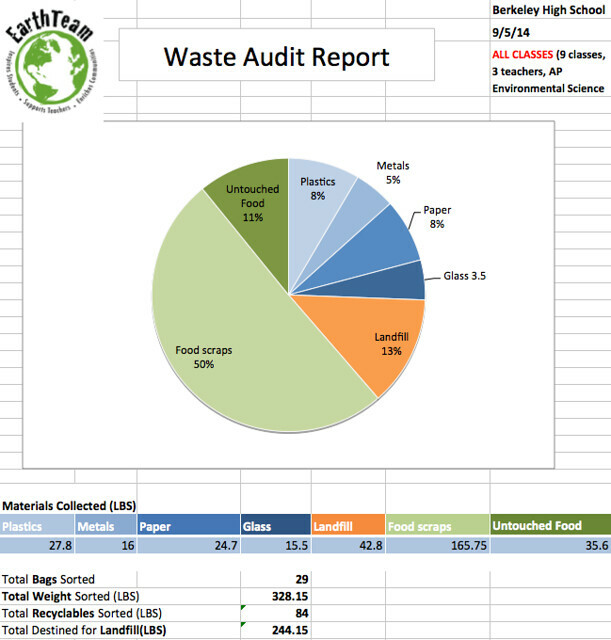 Students are taking the data they recieved during this waste audit and turning it into action to educate their campus about how to reduce waste. We are proud to feature Neha and applaud her work and enthusiam getting youth excited about keeping the earth clean. Thank you Neha, keep up the great work! EarthTeam is excited to nominate Patricia Williamson as teacher of the month! Patrica has been active in the Waste Action Project (WAP) and in the Transportation Action Project(TAP). EarthTeam helped Patricia and her students coordinate a bike to school day which was a huge success. We look forward to continue working with Patricia and her amazing students at ACLC! From Patricia: " I went to UC Davis and earned a BS in Wildlife Biology. I currently work at the Alameda Community Learning Center (ACLC). I have spent a good part of my 26 years of teaching collaborating with Save the Bay. Every year ACLC learners work to restore the wetlands in the local San Francisco Bay. Recently our work has been to develop leadership opportunities in the environmental fields. Now the work we do with Save the Bay is to train high school learners to lead wetland/ecology field trips for younger learners. I was introduced to Earth Team last year as part of my work as the SLWRP Coordinator for ACLC. Previous to Earth Team coming and doing a waste audit in the Spring of 2012 ACLC had no coordinated recycling program. The wast audit inspired two of ACLC's seniors to take on developing a recycling program for their senior project. The recycling program continues this year in large part due to the work the Environmental Leadership learners do. They work to help the community understand the program and build a community where the ethic is to recycle. Earth Team helps ACLC realize our mission which is to empower learners to take ownership of their educational experience and to actively participate in a democratic society." "I graduated from UC Berkeley with a B.A. in English and minor in Ethnic Studies. Working in the public sector and nonprofit world for a few years after graduation, introduced me to deeper and more realistic concepts of environmental sustainability than I had seen in college. After going on a service learning trip to El Salvador, I decided to quit my job and apply to teaching programs. I earned my teaching credential and later M.S. in Educational Leadership from CSU East Bay. I believe education can be the key to combating the most destructive aspects of society (i.e. climate change, bigotry, violence, etc) and making positive change possible. A meaningful education needs include putting ideas into action. When we design curriculum to be project based and about things students see as tangible, I find students are more accountable to each other, their community and it absolutely strengthens their academic identites. In short, students work much harder when they can see it matters. Doing projects with Earthteam like their Waste Audit, taking students to the LEAF conferences, participating and presenting in community forums, and creating projects that foster sustainability and civic responsibility helps students to do this. I have enjoyed my nine years working at Irvington High School, where this school strives to teach students to be their best selves." "I earned my BS from Purdue University in entomology and agriculture. I spent a year in Pakistan teaching at the International School of Islamabad. After that, I went to Cornell University to earn a Master’s degree in science education with a minor in environmental education. At Cornell, I worked as the assistant director for a stream ecology monitoring project designed to be implemented by teachers. This has inspired me to continue to work, as a teacher, to increase community involvement and protection of the environment through service learning. I’ve been teaching at Irvington High School for three years: biology, AP biology, and biotechnology. Before that I taught science at the juvenile hall in San Mateo. I have always loved science and once I was bitten by the teaching bug there has been nothing else for me! Every day I feel like the luckiest girl in the world – I get paid to do what I love, I get to have fun every day, and I get to help better the world with some of the best people on the planet. Thank you Earth Team!" EarthTeam is proud to announce Laura Larson as our March Teacher of the Month! This is Laura's second year as an EarthTeam teacher, and she and her students have participated in both the Eco-Stewards and Waste Action Projects. Laura has shown incredible dedication and enthusiasm for EarthTeam's programs as soon as she first learned about them during a SLWRP meeting. She has worked tirelessly to ensure that her students are able to participate in local field trips to their local creek, full-day field trips in Marin, and hands-on activities in their classroom. She and EarthTeam's Restoration Director are currently developing an after-school program to adopt the portion of the creek in the back of the school.